Once all the hustle and bustle of Christmas is over and you want to relax and read, The Road to Bittersweet is the book that I suggest you read. It will be available from Amazon on December 26 so if you pre-order it, the book will be there right after the busy holiday. "...it was like all we'd been doing was traveling down a road towards this bittersweet ending. Nothing could change what we'd been through." These are thoughts from Wallis Ann Stamper, the 14-year-old main character in The Road to Bittersweet. And what a road she and her family had been down. Living in a rural area in the Appalachian mountains in 1940 with her parents, sister Lacy and baby brother, they lived a hardscrabble life but always had food on the table and love within the family as well as their love of singing. Until the night that the Tuckasegee river overflowed its banks and forced them out of the house that had been in their family for generations. The family's flight during the flood was one of the scariest things that I've read in a long time. Wallis Ann survives the flood and starts looking for her family. Miles away from her home, she learns a lot about herself and the world that she had never been part of. The family gets reunited at the site of their home but they continue to struggle as they try to re-build. As the family tries to survive, they have to leave their mountain home and go out into the world where family loyalties are tested and decisions are made that cause horrible repercussions to them all. Wallis Ann is a fantastic main character. She is strong and can work like a man but she still has the feelings of a young girl. We see the land and the family problems through her watchful eyes and we see her change from innocence to wisdom about life and her family. This is a wonderful novel and I think it will be one of the most read books this winter. The is the second fantastic book by this author and if you haven't read her first book The Education of Dixie Dupree, you need to read it too. Warning: Be sure to clear your calendar before you start reading The Road to Bittersweet because once you start, you won't want to put it down until you finish. Trust me, there were no meals cooked or cleaning done at my house once I opened this book. This is Donna Everhart's second book. 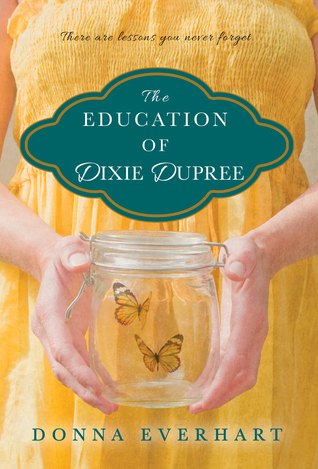 I highly recommend her first book - The Education of Dixie Dupree (Amazon). 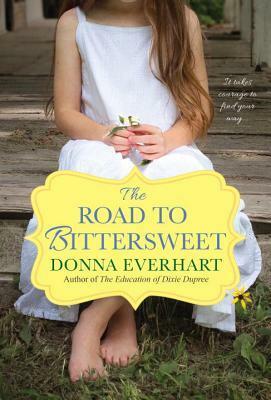 In Donna Everhart's debut novel, we meet 11-year-old Dixie Dupree in 1969. Dixie lives in Alabama with her parents and her older brother. Her home life is very unstable - her dad drinks too much and her mom is very unhappy in Alabama and longs to return to her home in New Hampshire. In order to try to make sense of her life, Dixie keeps a diary and it becomes the only place that she can share her deepest thoughts and questions about her life and her family without worrying about her mother's anger and punishment. She also copes with her life by telling lies and her family has learned not to believe much that she tells them. So when a situation occurs that really needs to be shared with her mother, she keeps it to herself because she knows that no one will believe her. This novel covers several very difficult subjects to read about but they are subjects that need to be addressed and discussed. This is a remarkable book told by an 11-year-old girl who is trying to figure out her family and her life. Dixie is a character that I won't forget.